This photograph was taken on a really grey and miserable autumn day about 20 years ago. 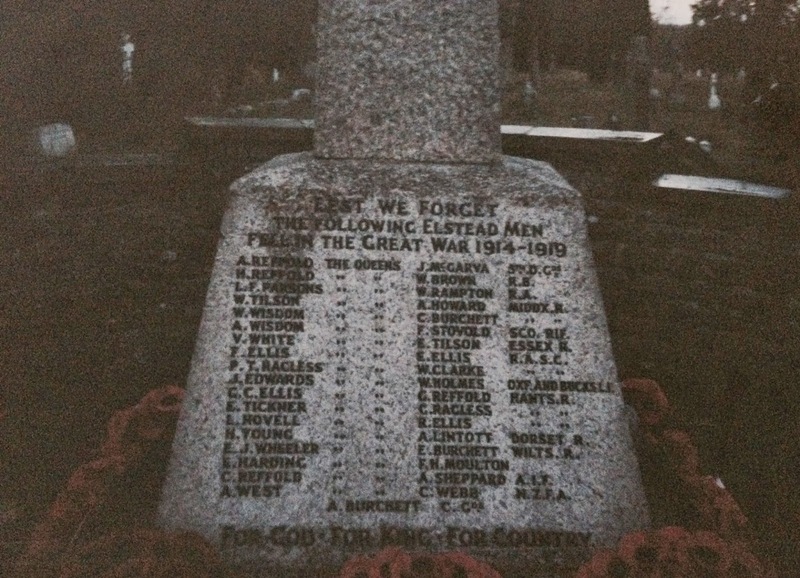 It is the War Memorial at Elstead in Surrey, about 2 miles from Puttenham where the majority of my Great Grandmother’s family hailed from. My Great Great Grandmother was called Caroline Ellis. Born in Puttenham in 1844 the daughter of George and Prudence Budd. My Grandfather’s cousin always maintained the Elstead got it’s name from the multiple Ellis families in the area, Ellis-Stead. How much of that is true I don’t know, except there were multiple Ellis families and unravelling them is a genealogist nightmare. The same names keep appearing; so I have three George and Sarah Ellis’ giving birth to children, with the same names around the same time. Nightmare to research! The Ellis’ on this memorial are in fact cousins of Caroline Ellis. I do have photographs of those named, but have elected to share them a little later on a project I have planned for 2014. However, this memorial is in fact incomplete. There was at least one more Ellis that gave his life and he is not named on the memorial. I became aware of Amos Ellis a few weeks ago when I received an email from someone. I had up until this point not been aware of Amos, because he was not a direct ancestor. I felt so sad that someone can contribute so much and yet simply slip through the cracks. So today, as I post late on Sunday and we roll across into Armistice Day it seems fitting to mention Amos and be aware that there are instances like this across the Country. Do we not owe it to these men and their descendants to put the matter right? This entry was posted in Uncategorized and tagged Ellis, Puttenham, Remembrance Day Photo Collage Festival. Bookmark the permalink.